This messenger bag is luxurious, stylish and comforting. Made by full-grain leather which means it is the toughest and most durable bag you can buy. The best thing about it is that, as it ages with time it becomes more beautiful, which means you never ever have to worry about its looks. A casual meeting or a business conference, don’t forget to flaunt it. If you remain on the move most part of the year and feel difficult carrying big suitcases for one day meeting then full grain leathermessenger might work for you. This bag has been manufactured using genuine cowhide leather and provides significant space so that you can keep your laptop and even clothes in a roomy main compartment. The bag is several pockets; one exterior backside zippered pocket, one interior walled zippered pocket, a protection sleeve for laptop or ipad and two interior slots for handy things. Team this bag with your office wear and get recognised among the crowd. One interior walled zippered pocket. One interior walled item, phone, wallet slot. Two interior walled pen/pencil slots. Leather and canvas adjustable shoulder strap. 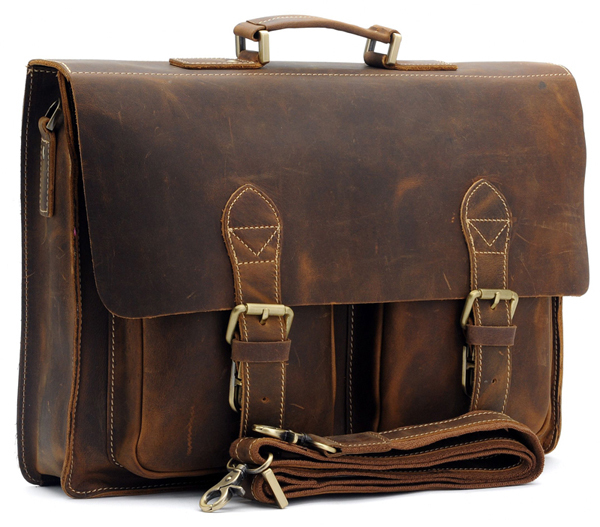 Looking for leather briefcase bag?